It sounds unbelievable: "We walk around the globe four times in the course of our life", says sports physician and specialist in orthopaedics Dr Norbert Becker. The main task of shoes is therefore to protect our feet, whose highly complex structure contains 26 different bones with interlocking shapes, ligaments and muscles, all of which are perfectly coordinated. This enables them to withstand the considerable stresses of everyday life, usually without complaining. With the universal leisure shoe HAIX BLACK EAGLE ADVENTURE 2.0, an outdoor boot of the new generation will be launched on the market in September this year, which optimally adapts to the needs of our time. Given that "The human foot is not a specialist, but an allrounder. Shoes should reflect this", as expert Dr. Becker emphasizes. 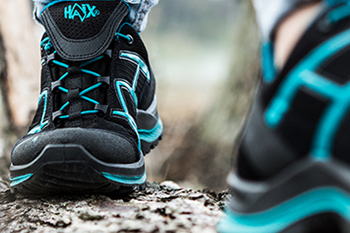 This is the approach followed by HAIX with the BLACK EAGLE ADVENTURE 2.0 whose novel sole technology guarantees consistently higher movement comfort and extreme slip resistance – regardless of the terrain or weather conditions. A sophisticated cushioning system also keeps the foot active, thus preserving its youth and health in the long term. "If shoes are too soft, they change load behaviour when walking, making feet comfortable and lazy. They get spoiled and become deformed", says orthopedist Dr. Norbert Becker as a word of caution. In contrast to many conventional athletic footwear BLACK EAGLE ADVENTURE 2.0 ,eschews soft cushioning elements. What's more: A sophisticated cushioning system and optimized footbed provide the foot with everything it needs. The dynamic rubber outsole is extremely lightweight and elastic thanks to the use of a special polyurethane technology and does not lose its shape. This innovative technology allows for the first time to completely abstain from the use of adhesives. The individual components of the soles are not glued, but securely anchored together through a much more elaborate direct injection process that also increases sustainability.